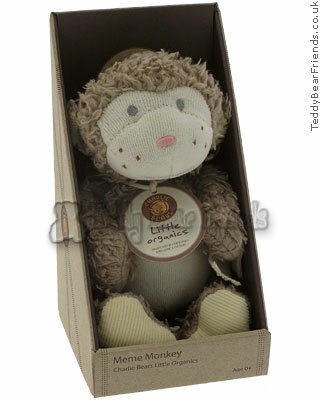 This small toy monkey for a newborn tot is MeMe from Charlie Bears Baby Organics. A beautifully soft and baby-safe gift, MeMe Monkey will make a lovely little present for a girl or boy. Charlie Bears make some of the finest teddy bears and now they have turned their hand to manufacturing baby soft toys with their new organics range. MeMe Monkey is made with certified organic cotton and has a brown body and a cream face and stomach. This monkey teddy is baby safe with stitched eyes and features and will look great in baby's cot. A fabulous little gift for an eco baby.